The nucleus of comet 67P/Churyumov–Gerasimenko seems to be composed of two parts. The latest pictures have caused something of a stir among scientists. 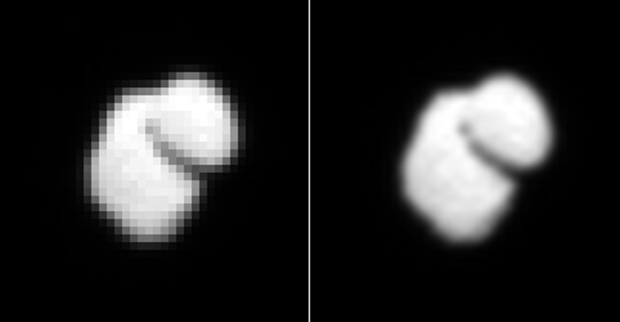 Left: picture of comet 67P/Churyumov–Gerasimenko taken on 14 July by the OSIRIS camera at a distance of about 12,000 km. Right: the same picture interpolated (smoothed). Credits: ESA/Rosetta/MPS for OSIRIS Team MPS/UPD/LAM/IAA/SSO/INTA/UPM/DASP/IDA. As Europe’s Rosetta spacecraft slowly closes in on comet 67P/Churyumov–Gerasimenko, we are beginning to get a sense of its rather unusual shape. The latest pictures, captured by the OSIRIS* camera on 14 July at a separation of about 12,000 km, confirm the highly irregular shape of the comet’s icy core, already suggested by previous images. 67P/Churyumov–Gerasimenko is clearly different from any other comet visited by a space probe in the past. Sequence of 36 interpolated images of comet 67P/Churyumov–Gerasimenko taken at 20 min. intervals by the OSIRIS camera on 14 July. Credits: ESA/Rosetta/MPS for OSIRIS Team MPS/UPD/LAM/IAA/SSO/INTA/UPM/DASP/IDA. At this relatively close range, the OSIRIS camera is able to take pictures of the comet at increasingly higher resolutions. The images acquired on 14 July clearly show its astonishing shape: 67P/Churyumov–Gerasimenko’s nucleus is composed of two parts! “It’s like nothing we’ve ever seen,” says Carsten Güttler (MPS). “It looks a bit like a rubber duck, with a body and a head,” he adds with a smile. Exactly why 67P/Churyumov–Gerasimenko’s nucleus is shaped like this is not clear. “At this stage, we don’t know enough about the comet, so we can only speculate,” adds Holger Sierks. Over the next few months, scientists hope to learn much more about the comet’s physical properties and mineral composition, helping them to determine whether its ‘body’ and ‘head’ were once two separate entities.